In 1990, operating from the trunk of his car and with his dad's 20-inch lawnmower, Jim Capone (35) went around Yorktown for an entire summer mowing lawns. That's how he started his business. He quickly bought a pickup truck and a commercial mower. Business picked up enough to help him pay his way through college. Though he loved mowing, he knew he had to diversify and offer more services to truly succeed. Today, about 3 percent of Capone's business is lawn mowing. His focus is on landscape design and installation of swimming pools, outdoor kitchens and lighting. His company, which now operates with numberous trucks and employees also provides asphalt paving, sealcoating, masonry and planting services - Virtually covering almost every aspect of the landscape industry.. When were you bit by the entrepreneurial bug? "Around age 12, I asked my dad to buy me a snow shovel. That $8 shovel made me about $100 one afternoon after school and a young entrepreneur was born." Why did you decide to start your business in Yorktown, where you live? "I moved to Yorktown with my parents when I was 16. It didn't take long to get adjusted to the area. The friends I made then were in my wedding party in August. When I purchased my own house it was a simple choice to buy in Yorktown as well. Yorktown is a great place to live and raise a family. I started my business there 18 years ago because it was a convenient location to my home. Since then, my business has grown and I remained in the county because of the quality of life here." "I am definitely a people person. I have met so many great clients and contacts over the last 18 years. Some of my relationships go back more than 15 years and I still have several clients from the very first day back in April 1990. Though a lot of my time is spent in the office or driving between job sites, I love to be outside and where better to spend it than around Westchester?" Recent cold weather aside, spring has arrived. Crocuses have broken through the hardened ground and the daffodils' green beginnings dot the side of the road. The promise of rebirth is exciting. Just don't look around too much. Old leaves still lie in collected piles scattered around the yard, sticking out from under a bush or between the rocks in a garden wall. The grass is lumpy and brown. In short, the yard looks a mess. It is clearly time to call in the landscapers. But, this year, how about something different - special. Landscape designers in Fairfield and Westchester counties are ready with practical advice and creative ideas to help spruce up your outdoor spaces. "I get people asking for putting greens in the back yard. It's a pretty popular feature," said Jim Capone, owner of Jim's Landscape Designs in Yorktown, N.Y. "You don't need a big yard for them either. They say that most of your game is your short game. "In big yards you can build a chipping area. We did one home that was on 2 acres and put a green in the back and (the home owner) shoots from the front," said Capone. "Sometimes you can tell who has them, they're made from synthetic grass so it stays perfectly green in the winter." Capone is among a number of landscape designers and architects happy to oblige what appears to be a growing desire among home-owners to engage their whimsical side when cleaning up after winter. While unusual ideas do have their place, much of the advice these landscapers give is geared more toward practical improvements. "Now is a good time to start thinking about what you want," said Capone. "In a week or two it will be time to plant, usually the beginning of April." And make sure the quick transition into warmer weather doesn't pass you by if you plan on doing any major restructuring. "A lot of people have begun to ask for landscape lighting and water features. Everyone seems to want more accent lighting and water features like waterfalls. People like the way water sounds. Perennial gardens around their living space is popular as well" said Capone. 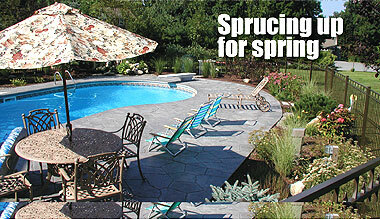 Landscapers cover more than just the greenery when designing a property. They take into account driveways, garden walls, pathways and any 'hard-scapes' that need doing. "There are so many different types of pavers (bricklike blocks) now that aren't commercial looking, they last, they're easier to walk on and can make more sense for some people than cobblestones," And they can be laid in many different patterns like "running barn," "basket weave" and "herringbone," he said. "Up county there is a lot of natural stone made to look like it's always been there. It's less formal and more country." "Lower Westchester is a little more formal the type of stone is more granite." It's not just stone that divides southern and northern Westchester. "Everything we plant north of Scarsdale are varieties that are deer-resistant. This is more and more suggested by the home owner.". "Zones are important. There really is a transition zone and we're right above it," he said. "There is a difference between what you can plant in Mount Vernon or New Rochelle compared to what you can plant up by Katonah or Mount Kisco. If you go to a retail nursery sometimes the nursery grower hasn't done their homework on whether we will have a harsh winter." So what is the cost of having a landscaper work on your property? "You can spend anywhere between $2,500 and $600,000," Capone said. "Any contractor worth their salt will say to get two or three other estimates," Capone said. "A lot of people shop around and get two or three quotes. It's good to have something to compare to. But don't get 10." Then the contractors just become numbers on a page, it's confusing. The quality of the work gets lost and it becomes a battle for the lowest quote. You want someone who fits your sensibilities. 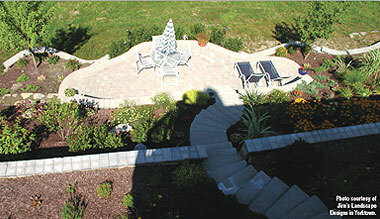 The best thing about hiring a landscape designer for your property is being able to translate your vision to reality. "People get to see the entire project laid out before them. It's such a benefit. Then, if they want, we can do the work in stages," Capone said. "We come out for a free consultation and, when we show you our portfolio, we'll give you ideas. Its worth it to do the work with us because what we charge for the design is given back as a credit toward the project," he said.